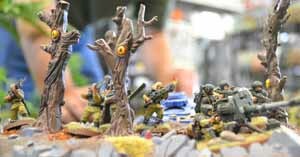 NEWS FLASH – Military authorities report a skirmish between PDF and Tau forces on Dar Sai, the second moon of Sculptor IV. Although there have been rumors of xeno activity on the moon, official confirmation came today after a short battle in the Hanui Valley, a rich agricultural region of the sparsely populated moon. Media report, dated: 3 009 735. LOCATION: Empire & Eagle Hobby Shop, Alexandria, VA.
MISSION: Big Guns Never Tire (4 primary objectives worth 3 VP each, secondary objectives include Slay the Warlord, First Blood, and Reserves. 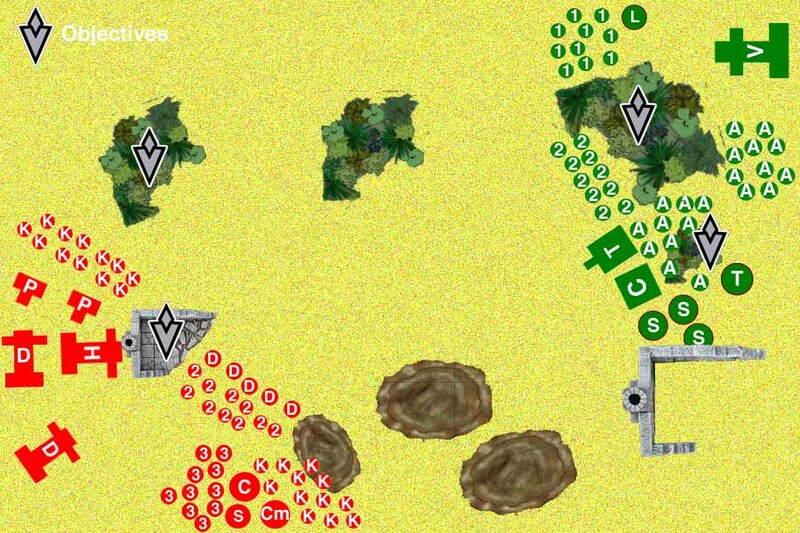 The first turn sees both armies advance cautiously. The Tau begin by sending Tribe #1 of Kroot toward the jungle in the north, accompanied by two Piranhas and a Devilfish with Squad #1 within. The Kroot make for the jungle; the armor slips behind the Kroot and goes flat out for the cover behind the jungle. 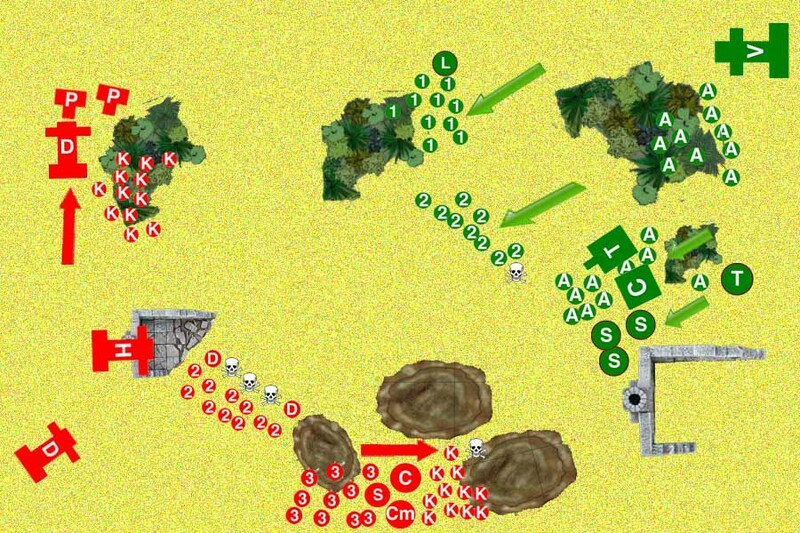 The ultimate goal is to position all these forces to rush out from the forest–or from behind it–on the same turn and overwhelm the Imperial north flank. Meanwhile, the Imperial’s 1st Squad also is running toward a jungle position. In the center of their line, the Tau arecontent with its deployed firing line–drones in front, backed up by fire warriors. The only movement is the Hammerhead, which slightly shifts its position so it has a better–although unsuccessful–shot on the Leman Russ Battle Tank. 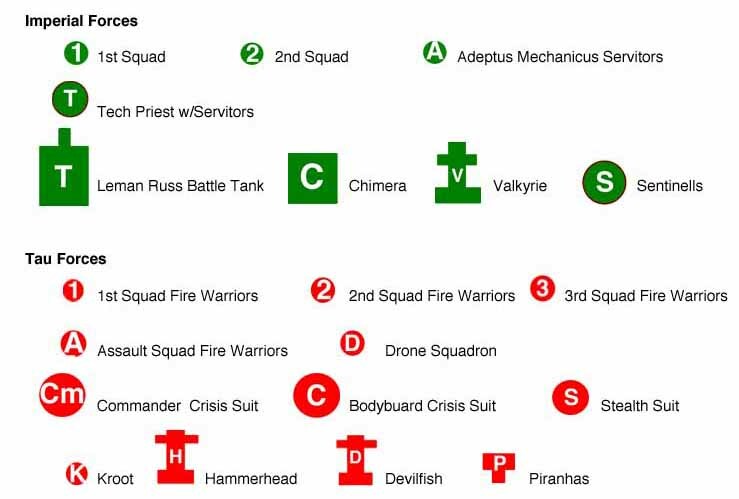 Behind the Hammerhead, the second Devilfish–with the Assault Squad–waits in reserve. On the Tau’s right flank, Tribe #2 of Kroot, along with Squad #3, usesd the cover of the hills to move along the south edge of the board. The Imperials send one squad into the center forest in the north, advance with another across the center, and towards the hills with the Adeptus Mechanicus servitors. The Imperial armor waits to see where it is needed. The Kroot make it to the jungle to the north and start moving through the foliage, while the Tau armor advances to its launch point behind the jungle. Imperial troops also move into a jungle position to prepare a firing line. In the center, the Tau firing line attempts to target the Imperials with two marker lights but fails. Still, it manages to let loose a long-range shot that kills one Imperial trooper.. The Imperials manage to kill three drones. To the south, the Tau advance, while the Adeptus Mechanicus servitors–and Imperial armor–take long-range shots at the advancing Tau. One Kroot is killed. 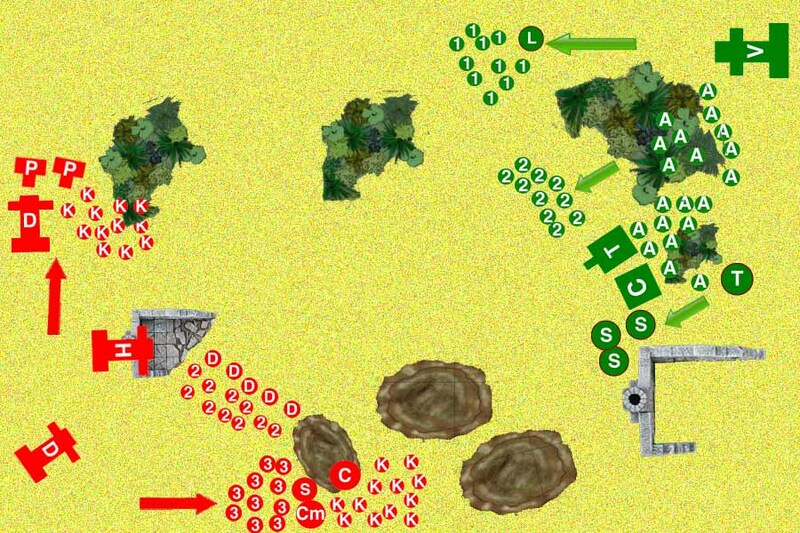 PDF troops set up a firing line in the northern jungle. The northern advance of the Tau stops, as the commander orders up a second Devilfish with the Assault Squad–and waits for its arrival.The Imperials move up to the edge of their woods and set up a firing line. In the center, the Imperials advance, while the Tau fire. Both attempts to target the humans with marker lights fail, causing some consternation that there are technical difficulties in the field. Neither Tau or Imperial armor can get a clean shot at its opponent. On the southern flank, the Tau continue its advance through the hills, taking casualties from the Adeptus Mechanicus servitors as they go. Two fire warrior and three Kroot are killed. The Imperial armor decide its time to advance south and take on the Tau advance up close. 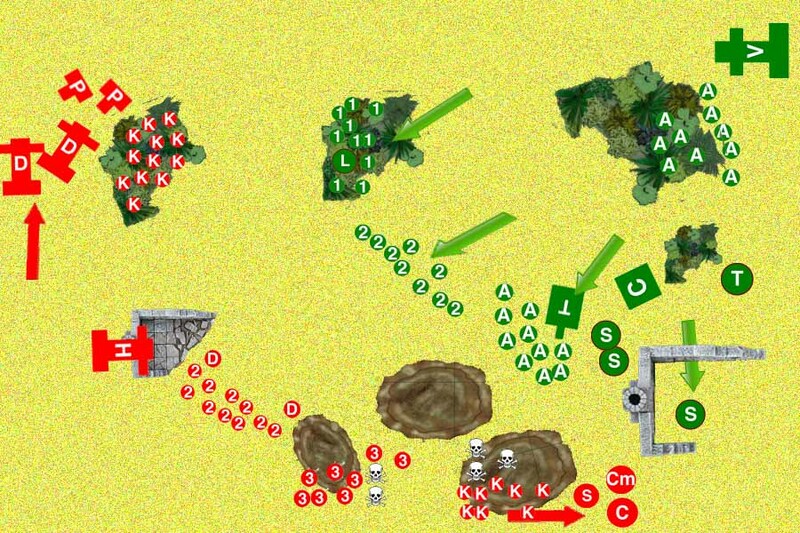 Read part 2 of this battle report.